Final results are pictured on the bottom of the page. Only four stains made it the end of the test. 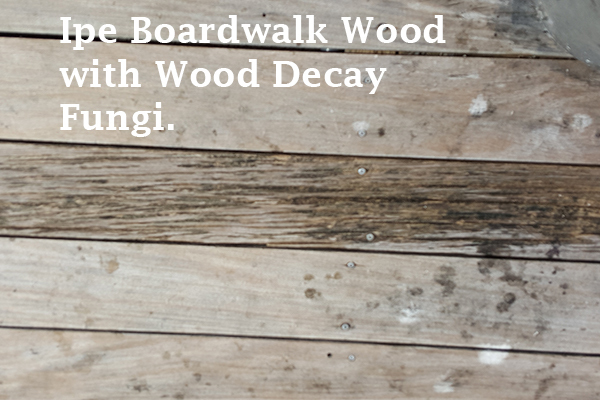 SUMMARY: This wood decay comparison was conducted over a little more than four years. The best deck stains and log finishes were chosen to see how they would compare side by side in identical settings. We were primarily checking different chemical wood preservatives to see how well they could protect wood in a high mold environment. Some were EPA Registered Wood Preservatives. These started out ok but none of these chemicals did very well long term. Solids content had a greater impact on durability. However, solids were not the deciding factor. Resin quality, solvent quality and inorganic mineral content had the most impact on long term protection. Usually, light toned stains that are flat on the ground get a maintenance coat after about 1-2 years depending on the quality of the product. Maintenance coats were not conducted. The wood was encouraged to rot in a highly conducive environment to natural wood rot. The picture speaks volumes but to hold these samples is remarkable. Some of the blocks could be crumpled up in one fist. While others remained structurally sound. WOOD TYPE SELECTION: 7 identical blocks cut from the same poplar board were compared under identical conditions. Poplar was chosen because it is prone to wood decay fungi and rots fast outside. No exterior wood finish is expected to last 4 years horizontal on the ground, on poplar. 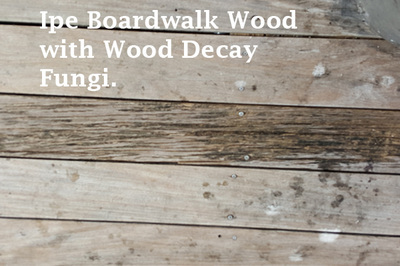 While poplar isn't a realistic deck or log siding wood, it is a good choice to compare wood decay. PREP: All were prepped with Lime Clean and 50 grit sandpaper. FINISH: 7 of the best regarded oil based deck stains and log finishes were applied in the same manner; exactly following label instructions. The top side was coated with run off brushed off the sides. The bottom is uncoated, laid directly on rough sawn pine. Some products specified 2 coats be applied. Some specified one coat. We followed the instructions on the label. COLOR: All products were selected in the nearest color to "Natural" which for almost all products was a light cedar tone. One product said "natural" but was a yellowish tone. LOCATION: Northwest facing, high mold, mountainside, 2200' elevation, laying flat on a horizontal surface. Nearly constant shade. PRODUCT AVAILABILITY: Only the first stain is widely available in stores. (There is a watered down version of the 3rd best finish in big box stores but it is 28% solids vs 77% of the real product. No comparison.) These are all considered professional quality coatings. Occasionally a paint store will carry one of them but most are ordered online. Names are blurred out except Earthpaint deck stains but even without names this comparison can be revealing. 2. Top Middle : Two coats of a top selling premium petrochemical based deck and siding stain. This product was very toxic smelling. Eyes water painfully during use and it is labeled as carcinogenic. Made from high solids linseed oil, mineral spirits, xylene, ethylbenzene and a common chemical biocide 3-iodo-2-propynyl butylcarbamate. RESULT: The closest pigment tone was called "natural" but was yellowish on poplar, at first. This block looked good the first year then the color slowly disappeared. Significant black mold became the main color after the first year. It did a lot better than the 4th place wood preservative even though this block is not an EPA Registered "wood preservative". Wood decay growth scale, 6 out of 10. 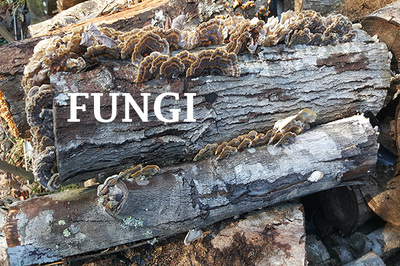 Ranked 3rd in long term wood decay prevention it has nearly twice as much wood decay as the 2nd place block. Some wood fibers are damaged but most remain intact. Some minor pitting is beginning. Structurally intact.This block could be washed with Lime Clean and recoated. VOC = Naphtha, Mineral Spirits, Ethylbenzene..., SFT / GAL: 350, SOLIDS: 77%. There is a watered downed big box store version at 28% solids. The label looks identical to the 77% solids coating version tested here. 3. Top Right: Brushed two coats to point of saturation. Premium deck stain with EPA registered wood preservative Copper 8-quinolinolate. This product seemed like it was mostly petrochemical solvents and mineral oil. RESULT: Failed 1st year. Wood decay growth scale, 9 out of 10. Wood not structurally sound. Not included in further testing. VOC= Petrochemical Solvents, SFT / GAL: 150, SOLIDS: Undisclosed but Irrelevantly low (likely below 30% resin). 4. Middle Left: Two coats to saturation. Conventional wood preservative with Copper 8-quinolinolate a common petrochemical based log finish. RESULT: Poor. Did well for almost a year but then black mold and wood decay grew significantly. The block is rotting. Wood decay growth scale, 8 out of 10. It's less rotten than the three conventional stain boards that failed. But the wood fiber is damaged internally. This block is not be repairable. The decay is too deep into the wood to wash or sand out. It is pitted and grooved on top and damaged internally. Granted this product states 4 years is the longest it will last but this damage was progressive. In a log home setting it would have needed to be recoated after about a year and a half. VOC = Petrochemical Solvents, SFT / GAL: 175, SOLIDS: Undisclosed but Irrelevantly low (likely below 30% resin). 5. Middle Row Center: A premium finish labeled as a "natural" sealer but it relied on petrochemical solvents and chemical biocides (natural?). RESULT: Failed 1st year. Not included in further testing. VOC= Petrochemical Solvents, SFT / GAL: 150, SOLIDS: Undisclosed but Irrelevantly low (likely below 30% resin). 7. 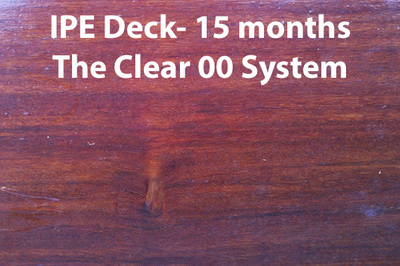 Bottom Row (RFS): The Clear 00 System - Light Cedar, a two coat system. Rainforest and Mountain XT Clear 00. Since these products are both very high solids, two coats formed a durable surface film. So, in this comparison, this block has an advantage in that a cashew based film was formed on the surface. This block was coated first with Rainforest Sealer - Light Cedar and then coated with Mountain XT Clear 00. (For this system, two coats of clear are recommended but this block did not require it and we wanted to avoid applying more coats than the comparison blocks received.) RESULT: Ranked 1st. The light cedar stain remains unfaded and the wood grain is still visible with the Mountain XT Clear 00 coat holding strong, providing a look of depth to the stained wood. The block surface continues to be waterproof. No splitting or fiber degredation on the surface. Wood decay growth scale, 0 out of 10. No wood decay. The only weathering is on the edges where water was wicked up from the sides and bottom. No stripping is necessary to maintain. This block can be washed with Earth Clean and receive a bolstering clear coat. OCT. 2010-JAN. 2015 - Deck Stain, Log Finish Wood Decay Weathering Test After 4 Years. As a clear coat on exotic hardwoods The Clear 00 System is exquisite!